Born in Budapest in 1913. Studied cello at the Franz Liszt Academy under Adolph Schiffer, and for several years attended Leo Weiner's legendary chambermusic classes. In his student days played under virtually all the great maestros of the time. After the war accumulated very wide experience in the opera repertory, having attended the Bayreuth Festival six times and , while working for the United Nations in Italy, experiencing the golden years at the Scala of Milan and the Teatro Reale of Rome. Spent the war-years serving in the British Army (Special Operations (Europe) and Political Warfare Branch). Settled in London, working as a Jurist and Company Secretary, but partnering many well known professional players in chambermusic sessions, and , although a strictly amateur player, still performing for charities or churchconcerts. He contributed PROFILES to the STRAD, of musicians at the beginning, or at the height of their carreers. 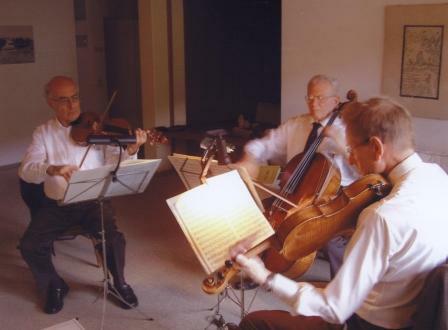 Assisted in Menuhin's Summer Academy in Gstaad, organizing chambermusic practice, and became, now for over 30 years an honorary member of the staff at the Lenk International Music Summer Academy in Switzerland, specializing in conducting chambermusic sightreading sessions.